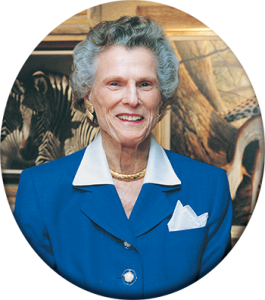 It is with heavy hearts that we say goodbye to an outstanding leader and friend, Joy McCann Culverhouse. For many years, she has been the heart of the Joy McCann Foundation and the charitable work the Foundation has supported within the Tampa community and beyond. Mrs. Culverhouse, a pioneering athlete, business woman, philanthropist and wife of the one-time owner of the Tampa Bay Buccaneers, died peacefully in Tampa on April 26, 2016 after a long and distinguished life. She was 96. Never one to sit on the sidelines, Joy was one of the first women granted a partial athletic scholarship when she competed as the sole woman on the men’s golf teams at Louisiana State University and the University of Alabama. She later established women’s golf scholarships at the University of South Florida and Jacksonville University. Joy married Hugh F. Culverhouse Sr. in 1942 and they were married for 52 years, first settling in Jacksonville. With substantial business success, the couple purchased the Tampa Bay Buccaneers franchise in 1973 and moved to Tampa. Perhaps Joy’s most famous creative contribution to the Bucs was picking “creamsicle” orange as the Buccaneer’s first team color, and she was often seen on the sidelines cheering on the players. After the death of her husband, Joy actively managed the couple’s business interests, and launched a distinguished career in philanthropy. Her legacy includes gifts to charities and non-profits totaling millions of dollars, including gifts to universities, community programs, and women’s and children’s causes. Specific charities include the Children’s Home, the MacDonald Training Center, the Boys & Girls Club of Tampa, and the Tampa YMCA.